Some preliminary notes on context. In the summer of 2014 we moved from the east to the west of the Detroit metro area. In the east we lived in Grosse Pointe; now we live in a village called Wolverine Lake. In Grosse Point Brigitte chanced upon a butterfly egg on a dill plant. The dill was growing in the crack of the concrete near our garage. Brigitte coaxed that egg into our first butterfly—raised indoors and then released. It was a Black Swallowtail. Thereafter we raised several generations of Swallowtails; they came to lay eggs on plentiful patches of dill we were always raising deliberately or by chance. Eventually we got to wondering why Monarchs never left traces enough for us to add them to the output of our Butterfly Ranch, as we came to call our tiny backyard. This led us to plant some milkweed there; Monarchs like to start new life on large milkweed leaves. That planting was around 2013, possibly earlier, but no Monarch ever came or, as we now believe, we never noticed. Monarch lay very, very tiny eggs, faintly yellow in color, easily mistaken as mere spots on the leaves. From these spots come tiny caterpillars that, initially, require a powerful magnifier even to see. So 2013 passed. We packed and moved to Wolverine Lake. Here, for some reason, Swallowtails haven’t yet found our forests of dill. We have much more yard here; thus we also planted several milkweed plants. On these, thanks to the much more educated eyes of our neighbor, Pat Littlefield, Monarchs left their eggs. With Pat’s help, we have finally succeeded in nurturing three of those invisible yellow spots into as many gorgeous Monarchs. We’re showing our third, a young lady, called Scarlet. When the first two, Romeo and Juliet, were ready to take wing, we had not yet mastered the art of releasing butterflies while also managing a camera. So now the Era of the Monarchs has begun here, in the west. More to come. As for ancient history, see the index and click on Butterflies. 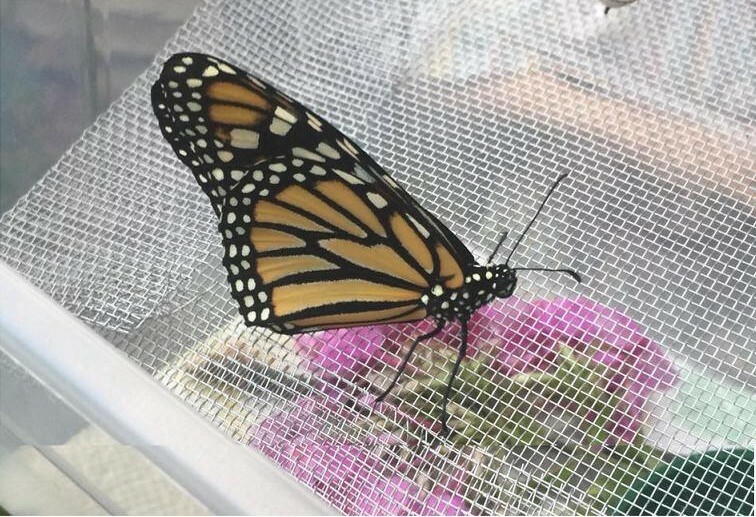 You'll see information on Monarchs as well, but not one that we had raised ourselves and released after its emergence from its translucent pupae.